Cora is an organic tampon for the smart and sophisticated modern woman. Designed to be both healthy and high-performing, Cora tampons provide the ultimate peace of mind. 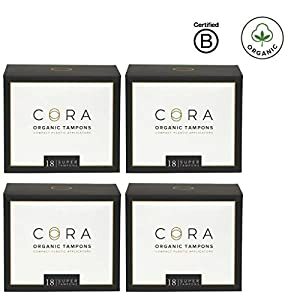 Made with 100% certified organic cotton, Cora tampons contain no synthetics, no dyes, no fragrances, no GMOs and no chemicals. Our Fearless Fit Design provides a true and more comfortable fit with maximum leak protection that expands widthwise for your unique shape. Cora's compact BPA-free plastic applicator allows the smooth and comfortable insertion you want with the chemicals you don't. Cora applicators are 100% recyclable and the soft and silent wrappers make for a discreet bathroom experience and easy applicator disposal. As if the product itself wasn't amazing enough, every box of Cora you purchase helps provide menstrual products to a girl in need in a developing country, keeping her in school when she would otherwise forego her education due to an inability to manage her period. We're on a mission to help every woman on the planet access safe and healthy menstrual products. Because we believe what you put in your body matters, Cora products are responsibly made without pesticides, insecticides, GMOs, rayon, polyester, fragrances or deodorants, chlorine bleach, or child labor, EVER.